We purchased this sink for a tiny bath in an antique house and couldn't be happier. 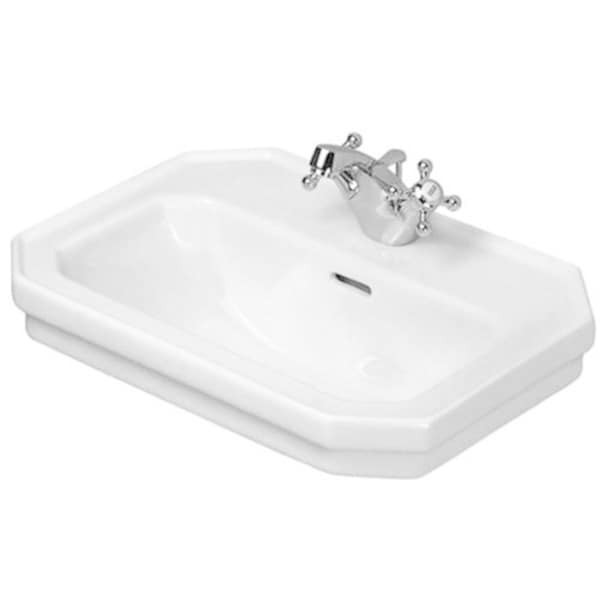 For it's size it has a large basin and functions almost like a full size sink. The most difficult thing is finding a small faucet to work with this sink's size. It only seems to come with a center faucet drilling, and petite single hole faucets are a challenge to find. I highly recommend this sink for small spaces. Give your bathroom a fresh new look with the Duravit 1930 19.75-inch White Handrinse Basin. This sink does not come with a faucet. Dimensions 21.0 In. X 16.0 In. X 8.0 In. "Is the drain 1 and 1/4 inch or 1 and 1/2 inch?" "it is a standard 8" spread between the faucet holes." Hello rockinfreakshow, the basin uses a single hole faucet. Thanks for shopping with us!